Evaluated over time, good breeder queens can be identified. 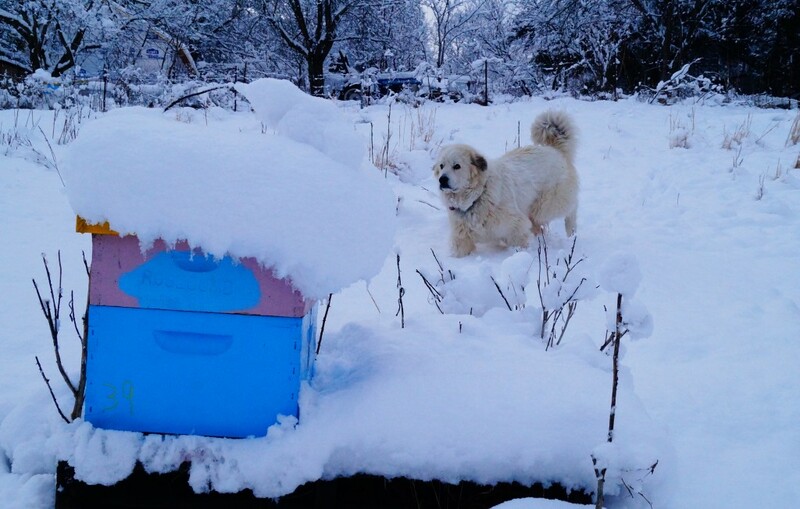 Here ‘Honey Bear’ stands gaurd waiting for spring. 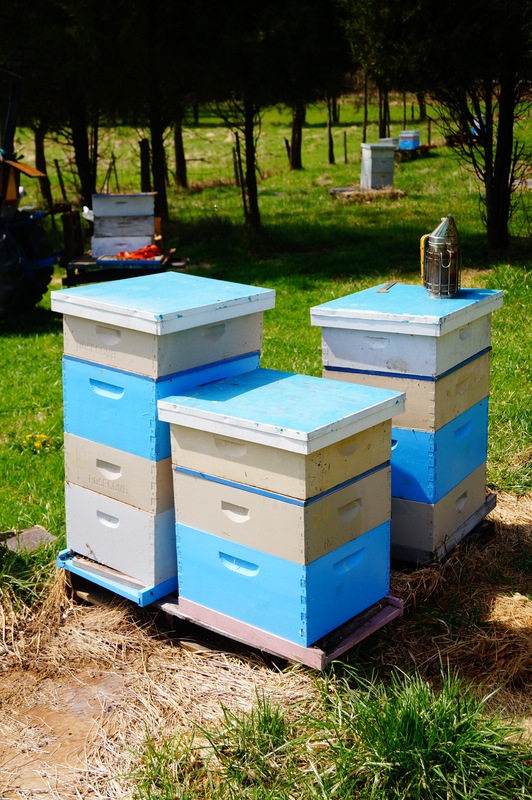 The main goal of this project was to improve an available mite resistant honey bee stock by selecting daughter colonies on their performance in a localized setting. Performance measures were based on nosema infection levels, varroa infection, and colony strength. In addition ratings based on visual observations of brood disease, deformed wings, brood pattern, temperament, and runny on comb were conducted. For each year of 2 years a new generation of daughter queens was started. Selection measures were combined in a selection index to aid in determining top performers. The top performers were then selected as breeder queens for the next generation. To determine if progress was being made in selection, pest levels were compared across 2 generations. Colonies were kept without nosema treatments. In the second year, spring nosema levels were significantly lower in the second generation than first generation colonies indicating that selection on low levels of nosema may be genetically reducing nosema levels in the population. However, without a control population, this determination is not conclusive, but is promising. It was attempted to keep colonies without varroa treatments in the first year, but it became obvious too many colonies would be lost without varroa treatments and they were treated in the second year. Therefore, it was not possible to determine if improvements were made in mite resistance or colony survivorship over winter. Fewer colonies died in the second generation during winter, but this is as likely due to mite treatments as genetic improvements in the stock. Before the 2 years of this project, European foulbrood was a problem in the starting population. For the first and second generation daughter colonies of the starting population, this condition was no longer observed. The starting population breeder queens were selected to be free of European foulbrood and no preventative treatments were given. This is another promising indication that genetic improvement may be occurring in the population based on the reduction of incidence of European foulbrood. There are two primary outcomes of this project. 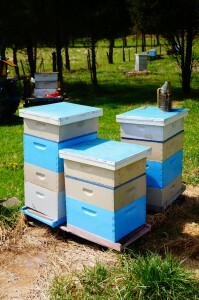 One is improved stock that is being distributed to local beekeepers in a similar environment. The second is the distribution of a realistic protocol of evaluating colonies for breeding purposes by part-time beekeepers. This protocol is outlined within this report, on my website at rosecombapries.com, and through presentations given to regional and state level beekeeping conferences. Variation is evident in these 4 colonies started at the same time. It is very likely, that genetics play a roll in the variation. One colony died over winter, while another one grew excpetionally well (left side). Another was average (right one), and the one in the front did OK. Breeder queens were selected from the colonies that grew the best and also were low in varroa and nosema. Losses in managed honey bee colonies have increased and remained high in recent years. It has become a consensus that multiple causes are responsible for colony losses and many of those causes are related to issues with the parasitic varroa mite and a gut parasite called Nosema. Over the last several decades, major advances have occurred in breeding bees to be resistant to varroa mites by selecting for hygienic behavior. Hygienic, mite resistant bees are being propagated and distributed through many bee breeding programs including the USDA-ARS Varroa Sensitive Hygiene (VSH) bees. However, few of these programs have incorporated selection for nosema disease resistance in parallel to mite resistance. 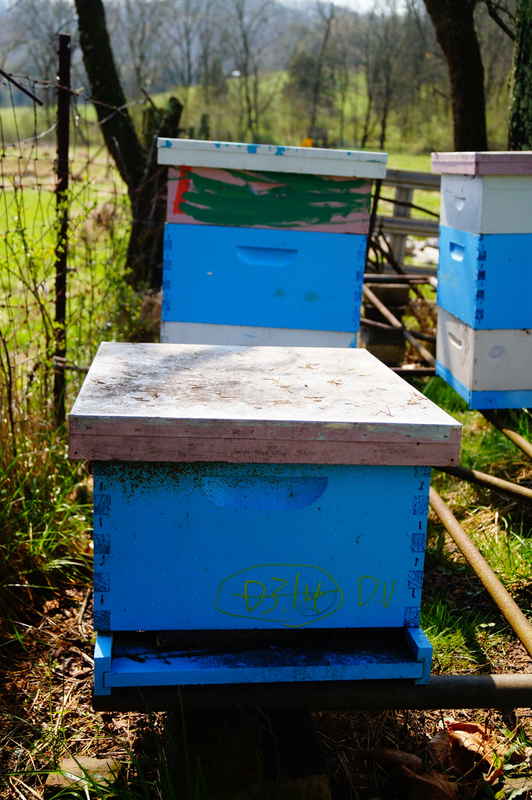 In addition, bees produced in these programs may be adapted to their specific location or conditions not shared by all beekeepers. Nosema disease is caused by two species of microsporidia, Nosema apis and Nosema ceranae. These unicellular organisms reproduce inside adult honey bees negatively affecting the mid-gut epithelium, hypopharyngeal glands, corpora allata (juvenile hormone), as well as oocytes in queens. Nosemainfected bees have a shorter lifespan, dysentery, nutrition digestion problems, cannot produce essential hormones correctly, and in many ways cannot function to maintain productive or surviving colonies. The microsporidia produce spores in infected bees and after defecation, these spores are picked up by un-infected bees to continue the disease cycle. Nosema disease is normally controlled by feeding the antibiotic fumagillin dissolved in syrup during spring and fall. Treatment is normally done without prior sampling to determine if Nosema spore levels are high enough to warrant treatment. In the past, there was a single species involved, Nosema apis. Now, a new Nosemaspecies in U.S. honey bees, Nosema ceranae, causes much more problems than previously observed. This may explain why nosema disease resistance has not already been incorporated into many historic, large scale breeding programs. Spore sampling for Nosema requires microscopic examination of bee samples and could possibly be used as a selection measure. Although there is some expense to microscopic examination, the procedure is relatively basic compared to other microscopic work. Monitoring varroa levels by mite sampling on adult bees is understood to aid in selection for varroa resistance. In addition to selecting for disease resistance, selecting bees by their performance under the same localized conditions they are to be used is long understood as an effective method to breed honey bees as evidenced in Brother Adam’s, “Beekeeping at Buckfast Abbey”. Nosema disease is an impediment to organic production in honey bees. Formal recommendations by the National Organic Standards Board to the National Organic Program in 2010 point out that antibiotics are not permitted for any type of livestock. It is unlikely the antibiotic fumagillin will ever be included as an allowed organic substance. There are numerous essential oils on the market for control of nosema disease, however none of these have been shown to work. There is some evidence of variation in response to Nosema by colonies and populations. Some colonies clearly are susceptible to Nosema and die from it while others thrive under the same conditions. There are effective organic treatments for varroa infestations, but not for nosema disease. Selecting colonies for resistance to nosema is likely to effectively control this disease as evidenced by recent work at the USDA Baton Rouge bee lab. Establish a realistic protocol to measure colony performance that evaluates disease resistance and productivity. Establish numeric data visualization techniques to make comparisons on performance measures. Document improvement in the population across generations. Distribute stock to local beekeepers. Conduct outreach through my website and beekeeping conferences. Some colonies dwindle over winter each year. In some instances this could be due to suceptabiiity to varroa or nosema, as compared to other colonies that did well under the same conditions. The starting population of honey bees for this bee breeding project consisted of ~ 50 colonies at one location. These colonies were headed by daughter queens of Varroa Sensitive Hygiene (VSH) inseminated breeder queens from Glenn Apiaries. These genetics came from the USDA Baton Rouge bee lab. Inseminated VSH queens had been used as mother queens for 3 years prior to the start of this project. Queens raised in this project were open mated, meaning the daughter queens would fly and mate with the drones they encountered in the environment. It was attempted to saturate the area with drones of VSH daughters by adding drone comb in the ~ 50 colonies and another apiary ~ 2.5 miles away that also had VSH daughter queens. 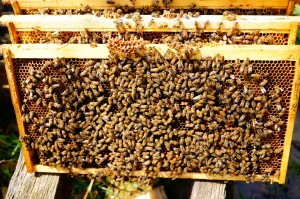 Over the 3 years prior to the start of the project, and during the project, queens were distributed to local beekeepers to also influence the drone population. At the start of this project, 3 New World Carniolan inseminated queens from Glenn Apiaries were used to start new colonies to be evaluated as potential breeding stock for the next generation. These New World Carniolans were bred by Glenn Apiaries to be mixed with VSH queens and to have varroa mite resistance from both the VSH genetics and varroa resistance bred into the original New World Carniolan stock from Susan Cobey and others. For the first generation daughter queens from these New World Carniolans, it is assumed they were bred to drones that had VSH genetics. The group of queens raised in the first year of this project will now be referred to as first generation queens. The first generation queens were evaluated as explained later and 3 queens were selected as breeder queens for the 2nd generation. The 2nd generation was evaluated in fall 2013 and spring 2014 to select 3 queens as mother queens for the 2014 season. During late winter, this colony died out, leaving few dead bees in the hive, even though there was plenty of stored honey. For each season of the project, colonies to be evaluated were started as nucleus colonies with 2 frames of brood, 1 frame of honey, and 2 frames of foundation on medium sized frames. Extra bees were shaken into each box. The nucleus colonies were given a caged virgin queen that was no more than 4 days old. These nucleus colonies were checked in 2 weeks for a laying queen. Any nucleus colony that had evidence that the virgin queen was not accepted and raised their own was removed from consideration. During Spring and Summer 2012, 50 nucleus colonies were started as the first generation. It was attempted to start all colonies at the same time, but it was not practical for this beekeeping operation to start that many at once. Of these 50, 15 were culled by July 10th, 2012 since they did not build up well in population during June. The other 35 daughter colonies were given the opportunity to build their own combs and populations and overwinter without treatments for mites, nosema disease, bacterial infections, or any other conditions. Of these, 14 died before March 2013. Measures in strength, disease and pest levels were taken periodically from July 2012 to March 2013. It was attempted to make evaluation on 4 different occasions, but this became impractical as some colonies were only recently established in summer, while others were established early in the spring. So, for evaluation, only three evaluations were used per generation. For the first generation, one evaluation was used in October 2012 that consisted of measures for varroa and nosema infestation, colony strength, and an evaluation based on visual observations of brood disease, deformed wings, brood pattern, temperament, and runny on comb were conducted. In February of 2013, an evaluation of colony strength was done by estimating frames of adult bees. In March 2013, the same measures used during October 2012 was repeated. The colony did not die from the lack of a queen. Here we can see the final attempt of the colony to raise more bees. The capped brood looked healthy, but there was not enough bees left to re-start in spring. When this colony started the previous spring, it was very productive and the queen looked just as well as many others as potential breeding stock. Obviously, things changed over time. For the second generation, the same measures were conducted during the same months of October 2013, Feb. 2014, and March 2014. The second generation was started with 79 new queens that were daughters from 3 selected breeder queens. Of the 79 daughter queens that successfully mated and were laying eggs in their new colonies, 20 were culled before measures were made by visually determining how well they seemed to be doing in their nucleus colonies. Another 9 were introduced into new nucleus colonies too late in the season to be successful enough to consider their performance on a genetic basis rather than environment. Of the 50 colonies that subsequently had selection measures performed on them, 31 were introduced into new nucleus colonies and allowed to build up to full size colonies on their own. Another 19 were used to requeen existing, full size colonies to allow for all 50 of the production colonies at the location to be evaluated. Unlike the first generation colonies, the second generation colonies were treated for varroa with Apiguard after the October 2013 inspection. This was due to prevent the number of losses seen the previous winter when no varroa treatments were given. No other treatments were given and there was enough varroa population growth over the winter to have variation in infection for spring evaluation. The measures used to evaluate colonies are explained in more detail here. Varroa infestation estimate: roughly ½ cup (~300 bees) was collected into a mason pint jar with #8 hardware cloth on the lid. These bees were collected from brood frames. A tablespoon of powdered sugar was added and allowed to sit for 1 minute. Then, the powdered sugar was shaken out of the jar onto a white plastic bucket lid for 1 minute. A spray bottle of water was used to dissolve the sugar and the mites could then be easily counted on the white background. This count was later converted to mites per 100 bees. 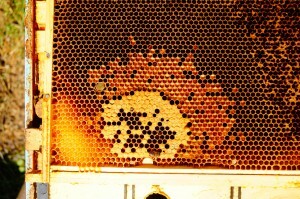 Frames of bees are easily estimated while checking brood for quality and disease. 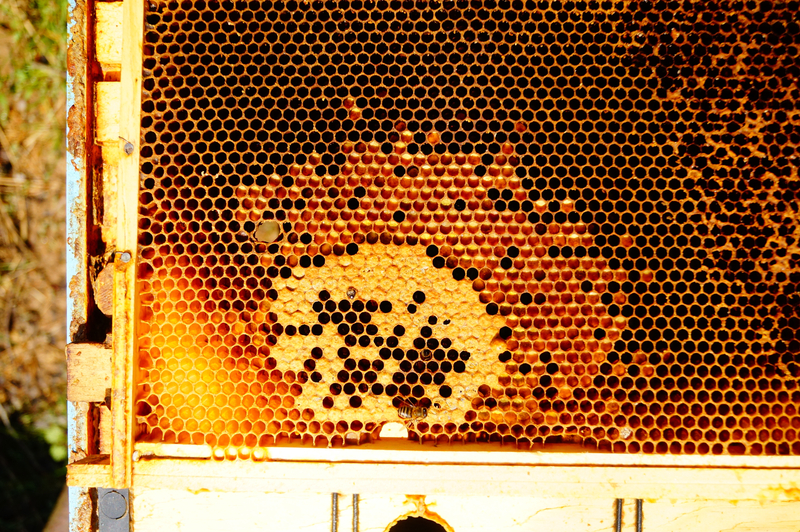 Adult bee population estimate (Colony strength): Each frame was removed from the colony and the coverage of frames by adult bees was determined by a visual estimate. Counts of ‘frames of bees’ was converted to adult bee population with the following formula: (medium size frames of bees X 1570) + (deep size frames of bees X 2430). Frames of brood was also recorded, but not used in the final selection process. Index of rated observations: While the frames of bees were being estimated, several conditions were looked for and rated 1 – 3 with 3 being the desirable outcome. The conditions noted were brood disease, deformed wings, brood pattern, temperament, and runny on comb. Brood disease was rated down to 2 if any dead or unhealthy brood was seen, or 1 if more than 3 unhealthy brood were seen. Deformed wings on adult bees is an indication of Deformed Wing Virus. Deformed wings was rated down to 2 if any bee was seen with deformed wings, or down to 1 if 3 or more bees had the condition. Brood pattern was given a 2 if there was no solid brood frame (some missing cells were acceptable) or down to a 1 if there was a spotty brood condition. Colonies that were honey bound (few places for the queen to lay due to excessive honey) were given a 2 for brood pattern, but a note was taken if the brood pattern problem was likely caused by being honey bound. Temperament was given a 2 if any bees tried to sting or run into the beekeeping veil during an inspection or a 1 if the colony seemed really defensive. If the bees were runny on comb, they were given a 2, or if they ran onto the sides of the frames and bunched up to the point where they would fall of in a ball of bees they would have been given a 1. No colonies exhibited this behavior. A perfect score on the index of observations would be a total 15. Once all the data was collected, it was summarized visually in graphs to determine which colonies were overall ‘best’ when considering all measures. The graphs for the second generation are attached in .pdf. The graphs were also useful in determining the effect of varroa and nosema levels on overwintering colony losses and to see how much the varroa and nosema levels are correlated to the adult bee population. In addition to the graphs, a selection index formula was developed with the assistance of Dr. Arnold Saxton. The formula, shown below, attempts to calculate a baseline, acceptable colony at about 0. 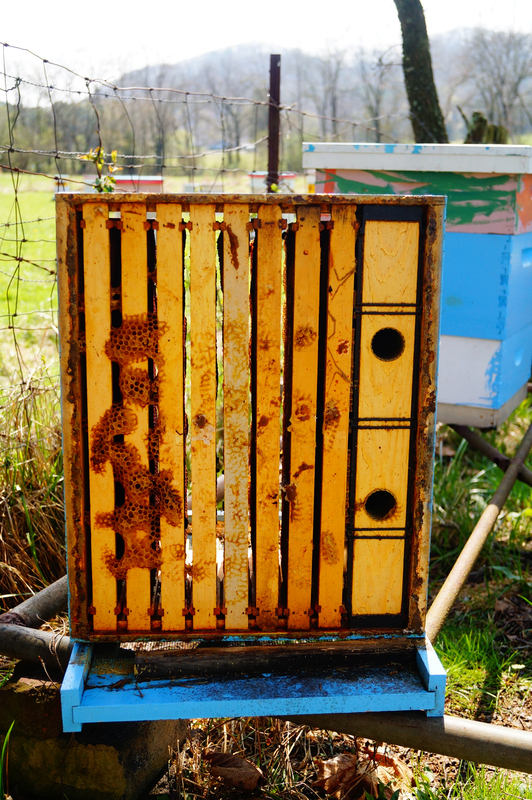 Colonies exceeding acceptable numbers of adult bees and having a perfect ratings score are rated higher, while colonies that have more than the acceptable amount of nosema infection or varroa mites get their score reduced. The formula is attached in a spreadsheet along with the second generation data. The spreadsheet allows for editing the formula so it can be adapted for other beekeepers. There are two primary outcomes of this project. 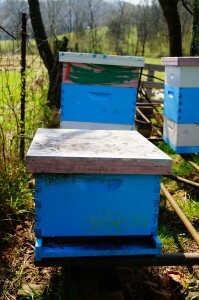 One is improved stock that is being distributed to local beekeepers in a similar environment. The second is the distribution of a realistic protocol of evaluating colonies for breeding purposes by part-time beekeepers. This protocol is outlined within this report, on my website at rosecombapries.com, and through presentations given to regional and state level beekeeping conferences. Some comparisons are presented below. To determine if progress was being made in selection, pest levels were compared across 2 generations. Colonies were kept without nosema treatments. In the second year, spring nosema levels were significantly lower in the second generation than first generation colonies indicating that selection on low levels of nosema may be genetically reducing nosema levels in the population. However, without a control population, this determination is not conclusive, but is promising. Spring nosema levels where chosen for the comparison instead of fall levels, so that the colony had more time to go through generations of worker bees from the mother queen and gave longer time for the colony to show susceptibility or resistance. To compare generation 1 and 2, a single factor ANOVA was conducted using Excell. The number of colonies sampled, their average millions of spores per bee, and the variance is reported in the table below. The p-value was 0.010414, indicating the difference was statistically significant. It was attempted to keep colonies without varroa treatments in the first year, but it became obvious too many colonies would be lost without varroa treatments and they were treated in the second year. Therefore, it was not possible to determine if improvements were made in mite resistance or colony survivorship over winter. Fewer colonies died in the second generation during winter, but this is as likely due to mite treatments as genetic improvements in the stock. However, An ANOVA analysis using Excel comparing the 12 colonies that died over the winter of 2012-13 to the 19 that survived did not find a significant difference in the mites per 100 bees between the two groups (died average 2.8 variance 6.3 vs lived average 1.9 variance 1.0). However, the variance in mite counts for those that died was high. 6 out of 12 colonies that died had mites counts at or higher than the accepted economic threshold of 3 mites per 100 bees, while the colonies that lived only had 2 colonies that exceeded the threshold at 3.3 mites per 100 bees for both colonies. Although not significantly different, it was decided to treat the 2nd generation colonies to avoid as high of a winter loss. For the second generation, 9 out of 49 colonies died over the winter (18% loss as compared to the first generation’s 39% loss over winter). Winter survival greatly improved in generation 2, but again due to the mite treatments it is not conclusive that this improvement in survival was due to genetic improvement. Before the 2 years of this project, European foulbrood was a problem in the starting population. For the first and second generation daughter colonies of the starting population, this condition was no longer observed. The starting population breeder queens were selected to be free of European foulbrood and no preventative treatments were given. This is another promising indication that genetic improvement may be occurring in the population based on the reduction of incidence of European foulbrood. However, since this condition did not occur in either generation 1 or 2 where the condition would have been measured, no objective statistical comparisons could be made concerning European foulbrood. The protocol used to evaluate colonies has been streamlined in a way that it can be repeated in unfunded years. The stock is improved as evidenced by a significant reduction in nosema disease. 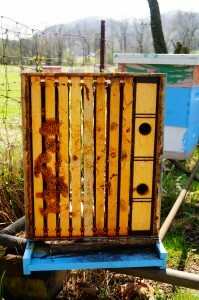 Before this project began, an antibiotic, Fumidil-B was used in this beekeeping operation to prevent nosema disease. Through the monitoring efforts during the bee breeding project, I was able to see that without treatments, nosema levels were at acceptable levels in many colonies. However, there were many colonies that had higher than acceptable levels of nosema disease. Greater than 1 million spores per bee is generally considered problematic. The colonies high in nosema levels did not seem to be susceptible to death or were they found to be low in strength (see attachment 2014 graphs). Therefore, I removed the practice of feeding the antibiotic Funadil-B in all of my beekeeping operation, not just the colonies being evaluated as potential breeding stock. This was a major accomplishment/milestone beyond the improvement of the bees themselves. Many colonies evaluated during this project were suspected to not be selected as potential breeders early on in the season. I continued to do evaluations on these lower quality colonies to learn more about what effects varroa and nosema may be having on colony strength and survivorship. These ‘lower quality’ colonies were still good colonies because I had already culled the lowest quality colonies. Therefore, I also was not certain that these lower quality colonies would not improve by spring of the following year. For future evaluations, I will not try and make as many detailed observations on as many colonies. I believe colonies can be rated on adult bee population and the ratings observation scores in the fall and only a proportion of the best looking colonies could then be evaluated for varroa and nosema levels. This fewer proportion of colonies could then be evaluated again in the following spring. If some of the colonies that were culled in fall and not included in the detailed evaluation instead seemed like the best colonies in spring, these could be evaluated only once in spring to determine varroa and nosema levels. However, some of the weaker colonies should still be evaluated to be able to make comparisons of varroa and nosema levels between two groups, stronger and weaker colonies. Seeing the levels of varroa and nosema which can only be done by methods similar to those presented here informs management decisions greatly in addition to being able to use these measures for stock selection. More important than making frequent and detailed measures seems to be to have a larger pool of potential breeding stock. In 2013, I started 79 colonies to evaluate and only 3 of these turned out to be truly exceptional colonies. For a small scale breeding program, doing some kind of evaluation on at least 100 colonies seems like a reasonable number of colonies to find some exceptional colonies for breeding purposes. To evaluate that many, the number and amount of detailed measures needs to be reduced to be able to fit it in most part time beekeepers schedules. Next Next post: Late Fall Anomoly?